Fences with the beauty of wood but none of the maintenance. Where can I get vinyl fencing panels that look like real wood? Yes. It’s that good. 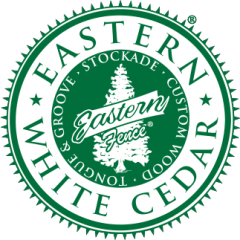 Eastern White Cedar trees everywhere are breathing a sigh of relief with the knowledge that the Grand Illusions Vinyl WoodBond authentic Eastern White Cedar grain is out and available. Never before has a vinyl wood fence had such authenticity. It’s almost impossible to tell the difference between wood and Vinyl WoodBond…. What difference can a new fence make on my yard? Where can I get brown vinyl privacy fence? How can I custom design a fence to match my home? Where can I get a neutral colored or gray vinyl fence? How can I match vinyl fence colors to my siding, trim, or accents? How can I pick the right vinyl fencing? Fences that will match your home with no need for a paint job or stain. Where do I Find Brown PVC Images of Grand Illusions Color Spectrum Brown Fence? Where can I get Walnut Wood PVC Fence? Where can I get a vinyl fence that looks like painted wood?